Mudras start electromagnetic currents within the body which balance various constituting elements and restore health. The joining of fingers creates an effect on the human body. While sitting any of the aasana for doing pranayama hands can be positioned in any one the mudras according to individual's own requiment. Gyan Mudra In this position the fingers are held with the tip of the index finger touching the tip of the thumb and the remaining three fingers nearly straight--kind of like an "OK" sign, except the palms of each hand are pointed up or front. This mudra is good for: stresses and strains, insomnia, emotional instability, indecisiveness, excessive anger, idleness, laziness, indolence, and is a great help in increasing memory and I.Q. It can help cure sleeplessness and get one off sleeping pills where these are being taken. Shunya Mudra This helps those with impaired hearing. If there is no physical defect, the mudra, if practiced regularly, can restore the hearing power. Remarkably, it helps in getting rid of earaches within minutes. It takes no mare than 2 to 3 minutes to get rid of most ear aches. It helps in relieving the nausea and vomiting sensations felt while driving on winding hilly curves or while taking off or landing in aircrafts. It helps in many problems of vertigo. 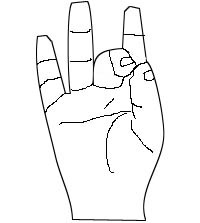 Aakash Mudra: Helps to remove weakness of bones, hearing deficiency.